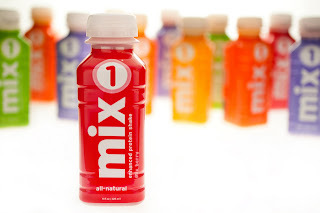 Recently, we were given an opportunity to try mix1 Protein and Antioxidant Drinks. * You overslept. When you have no time for breakfast, instead of that pitcher of coffee and super-sized danish, choose mix1. That way, you'll start your day with nourishing, sustained energy, not a harrowing ride on the Blood Sugar Roller Coaster. * You're going through your daily decathlon. Running from one life event to another (work, soccer practice, meetings...you now the drill) it's sometimes hard to eat well. Add mix1 to your midmorning and midafternoon, and sprint with energy to the next event! * After your workout. Post-exercise, your body and mind need to be recharged with a quality protein (to rebuild), and quickly-absorbed carbohydrates (to refuel). mix1 is a great way to restore properly with both necessary nutrients. * You just flew over three time zones. When you want to recover from the stress of travel, a sugary candy bar or a highly caffeinated beverage will not give your body and your brain the best opportunity to thrive. What you need is the perfect mix of vitamins, minerals, antioxidants, fiber, carbs and protein -- so reach for mix1 and boost your body and your brain! * On your way to class. You were up all night cramming for the big exam, and the time is here. But oh no! - there's that feeling - your blood sugar's in your feet. Drink a quick mix1 before you put your mind to the test - it's nourishing blend of vitamins and nutrients will help replenish your brain and keep you awake and sharp so you can put in your best performance. * The back 9/7th inning stretch/3rd set of doubles. When you're taking a break from your game - whatever your game may be - revitalize your energy and concentration with the vitamins and nutrients in mix1, and come back swinging strong! My children and I have all been consuming these drinks (my children more than me LOL!) and we all love them! I even have more energy and that's something that I don't see fast results with using daily vitamins. They are creamy and tasty! *If you choose to Become a Fan of A Simple Kinda Life on Facebook as an extra entry, the link is HERE. Be sure to stop by Moody Mama Says and Everyday Baby Steps and enter their giveaways!